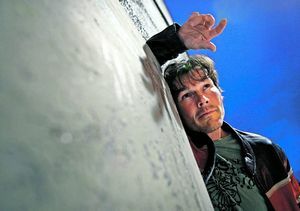 Morten Harket is putting the international release of his solo album “Letter From Egypt” on the shelf. This is because a-ha are already halfway through recording their next album. In late September/early October, the last part of the recordings for the new a-ha album will start in New York. “The ambition is for the album to be fully mixed and ready before Christmas”, a-ha manager Harald Wiik confirms. But he also makes it clear that the release date depends on plans for next summer which will be decided in the coming weeks. “A release in the spring is possible, but that depends on many things”, Wiik says. Therefore, Morten Harket is cancelling the international plans for “Letter From Egypt” – his first international solo opportunity since “Wild Seed” in 1995 – even before it really got started. This year’s “Letter From Egypt” hasn’t been that much of a success either, even though it has sold close to 30 000 copies in Norway. That is 130 000 fewer copies than “Wild Seed” sold thirteen years ago. “It’s an alright number, but we would of course have wanted to sell more than that. Unfortunately, the second single “Darkspace” wasn’t as successfull as the first single”, Yngve Næss from Universal Norway says. The album has also been largely ignored and without any chart success after the May release in Morten Harket’s second big market, Germany. Now the international plans are cancelled for good. “If you want a hit in Europe, you need to be travelling around for half a year”, says Wiik, who can reveal ambitious a-ha plans for next year. “There are plans for touring in many parts of the world next year”, confirms Harald Wiik, who doesn’t want to enter into any discussion about whether the record company has done a bad job with Morten Harket’s solo album. “Morten has this luxury problem that he is a member of a-ha, and a-ha gets the priority. When a-ha are now well underway with their new album, the possibilites for promoting the solo project naturally get limited”, Wiik says. Morten Harket himself doesn’t want to give any comments regarding the new a-ha album or the lukewarm reception his solo album has received internationally. The a-ha trio has done several double concerts this year – as a-ha and with their respective solo projects. Commercially, there seems to be little doubt that a-ha is what the audience wants. Last year’s “Best of”-album from Savoy was no success, and this year’s solo album from Magne Furuholmen, “A Dot Of Black In The Blue Of Your Bliss”, was nowhere near entering the Norwegian album chart.